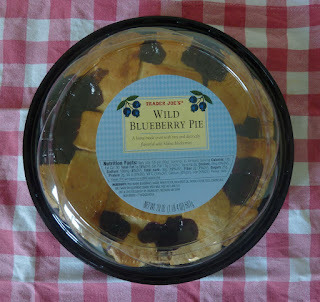 Since the Fourth of July is right around the corner, we'll go ahead and review this American picnic classic: blueberry pie. 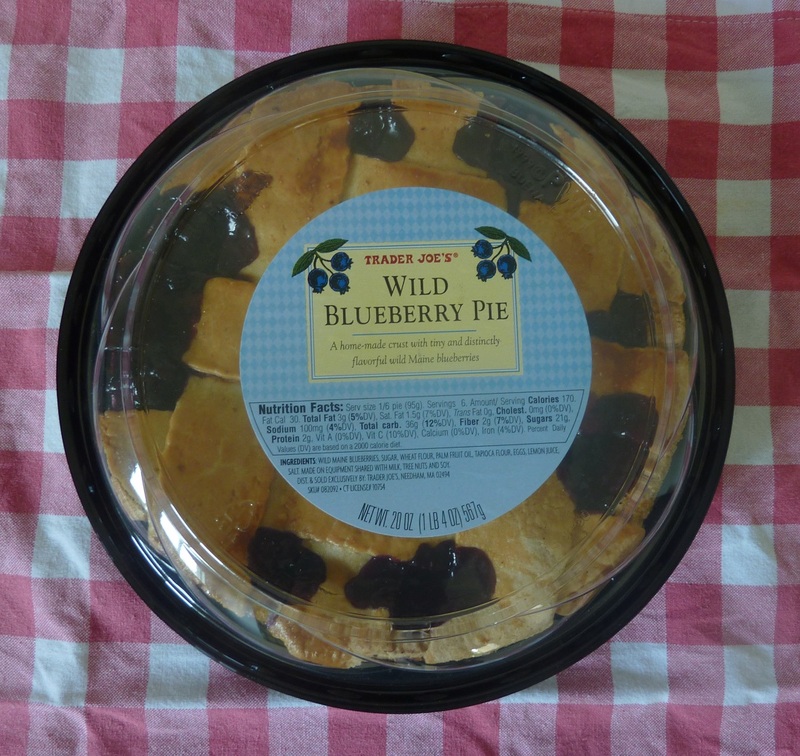 Perhaps it's not as stereotypically American as apple pie, but it's made with real Maine blueberries, and if you serve it on a traditional tablecloth like the one in the photo to the left, you've got an authentic slice of Americana, complete with red, white, and blueberry pie. Upon first bite, I was a little disappointed with the texture and taste of the crust. It's a poor imitation of homemade, it lacks uniqueness, and while I wouldn't call it "stale," it's way too stiff to feel like it's even approaching "fresh." Plus, it's entirely bland. The blueberries were a shade more exciting. Hundreds of perfect little blueberries in a subtly-sweet, semi-syrupy sauce saved the flavor of this pie. Coming straight out of the fridge, however, there was still an overall firmness that left me feeling like I was munching on something that fell a great deal short of the high standards I hold TJ's to. Sonia microwaved her second piece for twenty seconds or so, and claimed that it greatly improved the pastry. I followed suit, and wouldn't you know it—the pie took a giant leap in the direction of delicious. Still, the crust couldn't be redeemed entirely, but the smoothness of the blueberry elements all but made up for it. Could be if you tried this pie at an actual outdoor picnic that the hundred degree temperatures would have a similar effect as twenty seconds in the microwave. But served cold or warm, it's still a far cry from fresh-baked. However, keeping in mind that it's ready-made, sitting on a shelf, and only about $5 for a whole pie, we'll be merciful when we give our scores. Sonia and I are on the same page with this one. 3 stars a piece. Not bad. Blueberry pie is my favorite and I was very disappointed with this pie. I warmed it in the oven and the crust as still terrible. I can not believe that the same company that makes apple blossoms make this mess of a pie.